NEW YORK (WABC) -- Volunteers are making sure families across New York City are able to enjoy a healthy feast this Thanksgiving. The group '100 Black Men' has teamed up with Wal-Mart to distribute food packages to families in need. They are giving out turkeys, stuffing and other items to people at churches in all five boroughs. Organizers expect to help 12,000 families before the Thanksgiving holiday next week. 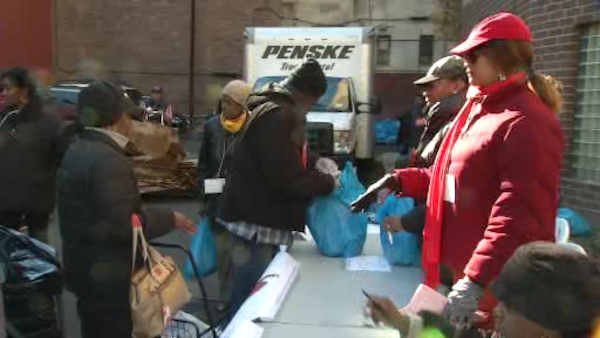 Hundreds lined for holiday food baskets at Canaan Baptist Church in Morningside Heights.